The Tim ‘E’ Show stars multi award winning Tim ‘E’ and his incredible band, The Yes Men. 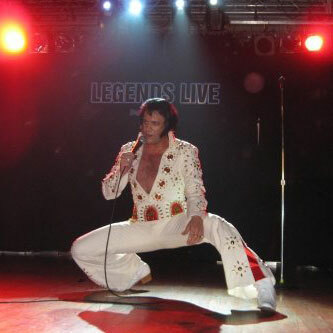 Tim ‘E’ is currently starring as Elvis in a Starz On Stage production, aboard Las Vegas Casino Lines in Port Canaveral, Florida. Tim E’s ability to capture the essence of Elvis Presley is uncanny and his love, admiration and respect for the King of Rock & Roll and his music, is clearly evident in every spectacular performance.Tim ‘E’ was recently selected to be the Headliner at the 1st Annual Toronto Elvis Festival in April 2009 at the Stage West Dinner Theatre. The Tim ‘E’ Show, backed by his 11-piece Professional Show Band, The Yes Men, has performed to sold-out audiences all over North America, including the 2003, 2004, 2005 & 2007 Collingwood Elvis Festival ( The World’s Largest Elvis Festival ). The show is an unbelievable replication of the raw energy, passion and conviction that was evident in every show thatwas performed by Elvis Presley.Relive the glory, the passion and the sheer joy of Elvis Presley and his music.